Let's see how the basic usage of the getEventListeners() command looks like. 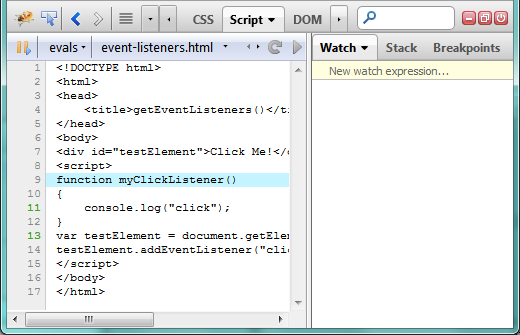 First, here is a test page that registers one click listener for a testElement. It returns a descriptor object that is logged into the Console panel. If you click the descriptor you'll be navigated to the DOM panel that allows further inspection. As you can see, there is one click listener registered with the testElement element (the click field is an array containing all registered click listeners). Clicking the myClickListener function navigates you to the Script panel to see its source code and perhaps create a breakpoint for further debugging. The expression returns directly the handler function that is logged into the Console panel. You'll be navigated to the Script panel directly if you click the return value. You might also want to manually execute the listener function and e.g. break in the debugger in case you created a breakpoint inside the method. Executing the following expression on the command line returns localHelper function since it's the registered event handler. If you want to log the original listener function myClickHandler - you need to get the handler argument that is accessed by localHelper closure. Next expression shows how variable inside a closure can be accessed (via: .% syntax). This expression returns reference to myClickHandler function. You can read more about Closure Inspector on Firebug wiki. You can also read wiki page about getEventListeners command. Does this also display MutationObservers observing the element? @aleth: Good question, not at the moment, but I like the idea and I'll ask around if Firefox could implement a new API for this!